This tutorial shows how to draw a ternary diagram in Excel using the XLSTAT software. The data used in this tutorial correspond to 3 chemical components and the yield obtained for a fourth component that is being tested. A ternary diagram represents within a triangle a set of points that have their coordinates in a three-dimensional space, with the constraint that the sum of the coordinates is constant. Select the data on the Excel sheet. The third column does not need to be entered as the values are known from the 2 other dimensions and the value of the constant sum that is entered in the Options tab. We select the yields in the Objects labels field so that they are displayed on the ternary plot. 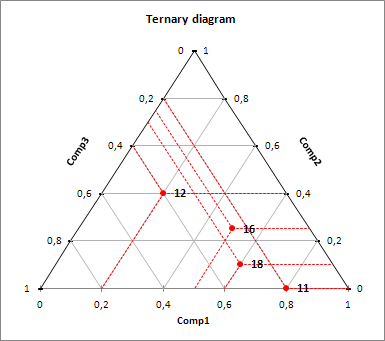 The Charts tab allows defining a triangle to focus on within the ternary plot. Here we left the default with all minimum values set to 0 and all maximum values set to 1. The number of segments determines how many tick marks and values are displayed along the axes. We decide to display the projection lines, the lines between the axes as well as the labels. The Link the chart to the input data option can be used to update the diagram in real time when the input data is modified. After you have clicked on the OK button, the ternary diagram is displayed on a new Excel sheet (because the Sheet option has been selected for outputs). It allows to see how the points cover the space and to detect potential zones that should be explored in further experiments. The following addresses ternary diagrams, with illustration using Excel and XLSTAT.